Be the first to share your favorite memory, photo or story of Hope. This memorial page is dedicated for family, friends and future generations to celebrate the life of their loved one. 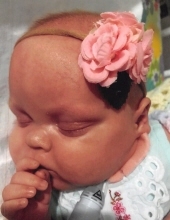 Hope Sharpe, 15 month old daughter of Tiffany Woody and John Sharpe both Annville, was born October 24, 2017 in Lexington and passed away Wednesday, January 30, 2019 at the U.K. Medical Center. In addition to her mommy and daddy, Hope is also survived by two brothers, nine sisters, host of aunts, uncles, cousins and friends and also by Shelley “Mama Bear” Herald, her care giver since birth. "Email Address" would like to share the life celebration of Hope Sharpe. Click on the "link" to go to share a favorite memory or leave a condolence message for the family.